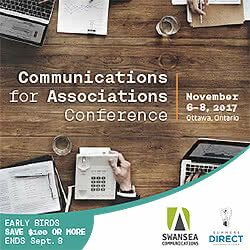 For over a decade, SummersDirect Conference & Events and Swansea Communications have been bringing together communications professionals from across Canada for quality conference programming. This partnership is the only in Canada that has provided both national and regional conferences for communications professionals. Our goal is to offer a conference experience that will educate and inspire professional communicators from various industries through an environment of professional networking to benefit both delegates and speakers alike. You will walk away with tools and techniques you can take away and use, case studies you can relate to and most of all VALUE. Together we want to build a long-lasting relationship with you! We are excited to have you join us and hope you return year after year. Please call 1.780.747.2958 or email us at info@summersdirect.com. Conference rate of: standard/double $199 or triple $214. For reservations please call 1.800.341.2210 or 1-613-241-1000 or visit here. Please identify yourself as being with the SummersDirect Inc. group when making or amending the reservation. Prices are guaranteed until Friday, September 22, 2017. Communicatto is a fast-growing digital marketing agency that has specialized in telling corporate and industry stories on the internet since 2009. Corporations and industry associations need content for the internet and we aim to provide it, in a strategic manner. That can mean developing strategy (our mainstay), blogging, social media management, digital advertising, SEO and much more. Our work is national in scope, often bilingual, real time, sometimes controversial and usually political. We’ve never been more challenged to trust messages in our society. The constant content deluge, addiction to media, industries in constant transformation have led to a near-constant state of distrust, skepticism, and polarization. Connected groups have never had a greater opportunity to rise to the occasion and be the answer for this state of disenchantment. Associations can and must engage with new tactics, new measurement, and nurture new trust with a distracted, disengaged, and even distressed membership. Join National PR in a session that will cover digital trends, the state of trust, communications and engagement strategies for associations. Video is where the eyeballs are. Even so, most associations have failed to make it part of their content strategy. In this session, we’ll debunk some of the more common barriers and provide a practical overview of equipment, dos and don’ts, tips for shooting, framing, lighting and sound, keys to visual storytelling, simple editing techniques and best practices for getting maximum engagement with your videos. Participants will also be treated to case studies, examples using more than a dozen short videos and a Q&A session. What happens when your association has to re-invent itself to survive? What are the communications advantages and pitfalls and how can you leverage them to communicate your metamorphosis? Organizational re-designs are communications minefields, and associations must use all assets at their disposal in order to re-brand and re-group. Join a session that will uncover the relatively hidden communication trends and foibles of Canada’s biotechnology industry and how new and traditional communications tools and tactics were used to re-engage alienated stakeholders in a national non-profit association’s overhaul of its entire operation. Producing audio podcasts to promote events, to engage members and to market to new audiences can be an important addition to your communications plan. Based on experiences from events and organizations large and small, you’ll learn why podcasts are gaining in popularity and how to produce a podcast (from a high level). Delegates will discover the benefits of podcasting for an association and learn the basics of how to produce a podcast. Relax and have fun getting to know fellow conference attendees by sharing hot button situations that trigger an emotional reaction. Get clear on the personal values represented by your hot buttons. Move forward with a fresh perspective and liberating self-awareness about what makes YOU great. It is often an association’s role to tackle very tough media inquiries that individual members will not, or cannot, speak to as individuals. 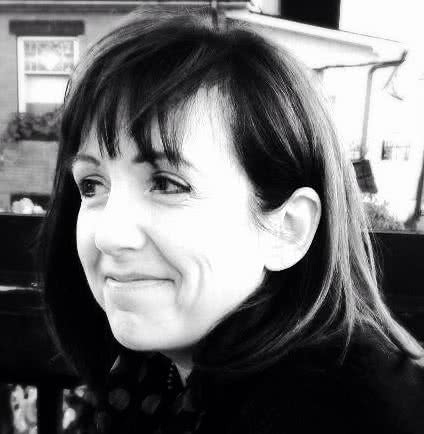 This session will explore your options when navigating difficult media situations. It will help you to manage contentious issues, prepare prudent messages, and tell your sector’s story, no matter how great the challenge. The opportunity for today’s communications professional is to go beyond information dissemination, and step up to become an indispensable agent of change. Association communicators are uniquely positioned to drive change and enable the transformation agendas of their organizations. This is becoming the essential skillset, and mindset for our profession. This presentation will put the spotlight on the opportunity you face as an association communicator to be a transformative agent of change, and illuminate the path forward for you to fulfill this elevated role. Participants will learn practical skills and techniques for shaping communications approaches and messages in support of change management. You’ll come away with new insights and renewed confidence to unlock your full potential and impact as a change maker. From PT Barnum to Red Bull — What is experiential marketing and how can it help associations? Read a blog post or magazine article in 2017 and you’re sure to come across the term “experiential marketing.” While not a new concept, it’s getting plenty of recent attention and many associations are questioning what it really means, what advantages it might have, and how it can be done on a budget. Join Christian to discover how an association can leverage experiential marketing to increase brand awareness, foster new relationships, increase membership, and develop a strong feedback loop with key stakeholders. It will be an “experience” you don’t want to miss! Everything on the Internet is free, right? Ever wonder if that meme you’re sharing could get you in legal trouble? Worry that your social media intern is sharing copyrighted images or videos? If you’ve answered yes to either of these questions, this session is for you. Designed to be a crash course on copyright issues in the digital world, this presentation will provide you with the essential tools you need to create great content while avoiding copyright pitfalls. .
Social Media – misconceptions about creating cartoons, memes, videos and more. Creative Commons – what is CC-licensed content and how can you use it? How do associations stay relevant in the digital age? In this session, Doug Lacombe, President of Communicatto Inc., will illustrate how association communicators can use social and digital platforms to attract, retain and advocate for their members. Doug will dive deep into why digital and will provide attendees with easy steps to get started on digital today. delegates will break into small groups and share their own experiences in what works and what doesn’t work in communications. Delegates will walk away with numerous case studies and a best practice list. Association Communicators don’t always have on hand the biggest budgets, the largest teams or the most time to do everything they’d like. Through a case study approach, learn how your content should pass the 1×5 rule to: deliver member value, educate key audiences, connect with stakeholders, strengthen advocacy, and…be human. By applying the 1×5 rule to even your simplest com- munications activities, you can save time, say more, be strategic, and deliver value to your association. It’s a “squeeze or get squeezed” approach for the small communications team! Doug Lacombe, President, Communicatto Inc.
Is your association’s online marketing a hodgepodge of random tactics that resembles something like spaghetti thrown at the wall? The Real World Online Marketing workshop will guide you out of the quagmire, and bring order to your association’s digital chaos. In this step-by-step workshop, Doug Lacombe will walk you through the building blocks of an online marketing plan, addressing the unique challenges of association communications. Hands-on exercises will cover audience targeting and persona building, media mix and tactics such as content marketing, SEO and digital advertising. You’ll leave this session with a concrete plan to transform your digital ideas into action as soon as you’re back at your desk – if not sooner! Like Build a Bear ™ but with more social and less fuzz. Doug Lacombe is President and Founder of Communicatto Inc. Drawing on over 27 years of experience in media, web publishing and technology; Doug and his team work with businesses and associations to integrate traditional and digital communications, with a focus on content marketing and social media.